Thatcher Hall is one of ten structures that comprise the Northeast Residential Area of the University of Massachusetts Amherst. It is a 3½ story brick neo-Georgian structure of 1935 with a slate gambrel roof, regularly-spaced hip roof attic dormers with single and paired windows, and paired brick interior chimneys at the northwest and southeast ends of the building. The building is 17 bays wide and three bays deep. It has decorative brick quoins at its corners, a brick water table at its basement level, and brick stringcourses. The windows are wood. Thatcher House has a wood dentil cornice at the roofline and within the gable peaks. The 3-bay wide south and north end elevations have identical designs, except that the south end elevation has no basement window on the west side of its door. The south and north end elevations each have a side entrance, set at the half-flight level between the basement and first story. The entrance is sheltered within an arched and paneled recess that has a fanlight above the door. The door has 3/3 fixed panes in its upper half and two vertical panels in its lower half. The fenestration pattern stacked above the doorway, at the center of the south and north end elevations, is set at the half-story level, including an oculus window immediately above the doorway, which indicates that staircase landings may be located behind these windows. The central 12/12 sash window above this oculus has a wood balcony, with a balustrade, that is supported by elaborate carved brackets. This window is framed by pilasters that are backed by slightly wider wood blocks, and the window frame has a segmental pediment. The central door, oculus, and balconied window are flanked at each story level by a single window, set near the quoins. These flanking windows are horizontally aligned with the windows on the building’s east and west elevations. On the first story, these flanking windows are 12/12 sash, with 8/12 sash on the second story and 8/8 sash on the third story. The basement story has 4/2 awning windows. The attic story of the south and north end elevations includes two oculus windows, flanking a central 8/12 sash window, and a demilune or crescent-shape opening that contains a louvered vent. The building’s east elevation facing Thatcher Way is 17 bays wide and includes two 3-bay wide, front gable, projecting brick portions, which are located near each end of the elevation, set one bay in from the south and north ends of the building. The fenestration on each story of the projecting portions consists of a central three-part window with a single window on either side. On the first story, the single windows are 12/12 sash and the three-part windows are comprised of a central 12/12 sash flanked by 6/6 sash. On the second story the single windows are 8/12 sash and the three-part windows are a central 8/12 sash flanked by 4/6 sash. On the third story the single windows are 4/4 sash and the three-part windows are a central 8/8 sash flanked by 4/4 sash. The gable peak has paired 4/6 sash windows with an oculus window to either side. The portion of the east elevation between these projecting sections has a central door that is flanked by an unbalanced number of windows, with four windows to the south side of the door and three windows to its north. The windows in the first story of this section are 12/12 sash, while the second story ones are 8/12 sash and the third story has 8/8 sash. The attic dormers variably contain either single or paired 8/8 sash. The building’s west elevation is 17 bays wide and has the same 3-bay wide, front gable, projecting brick portion layout as the east elevation. However, the west elevation is fully symmetrical, with evenly spaced windows and dormers in the 9-bay wide central section. The first story of each projecting portion contains a central door within a portico that has non-fluted Ionic columns and a broken segmental pediment. Each door has 3/3 fixed panes in its upper half and two vertical panels in its lower half. Each portico is at the top of a low, 3-step, brick and concrete set of steps. 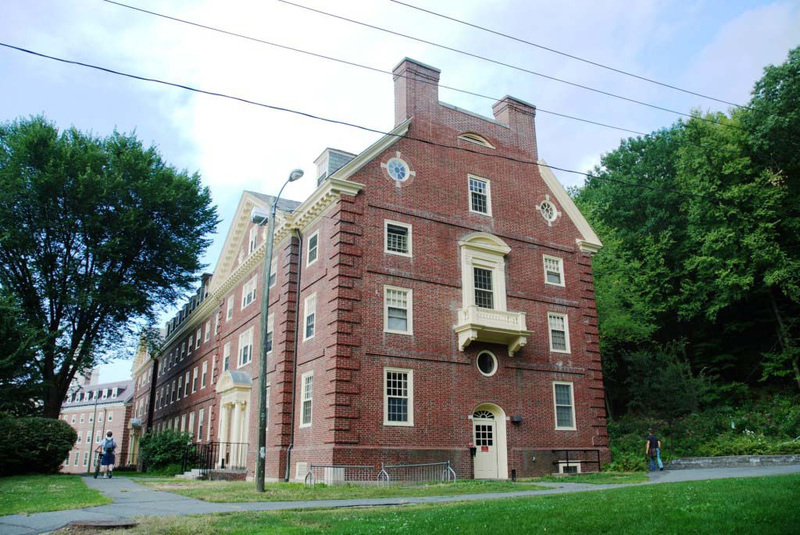 The diminishing fenestration pattern seen on the different stories of the east elevation (for example, 12/12 sash on the first story, 8/12 sash on the second story and 8/8 sash on the third story) is repeated here on the west elevation. Thatcher House is located along the west side of Thatcher Way to the south of the Lewis House on a site that slopes from the east to the west. All four sides of Thatcher House are bordered by bituminous concrete pedestrian walks with sets of concrete stairs leading to the building’s entrances. The site to the west of the building consists of a slope with deciduous trees over ground cover. At the base of the slope is a mown lawn quadrangle with a mixture of deciduous and evergreen trees. East of the building is Thatcher Way with a heavily wooded/forested area beyond. Site furnishings surrounding Thatcher House include wooden benches, wooden tables, and a metal bike rack at the southern end of the building. 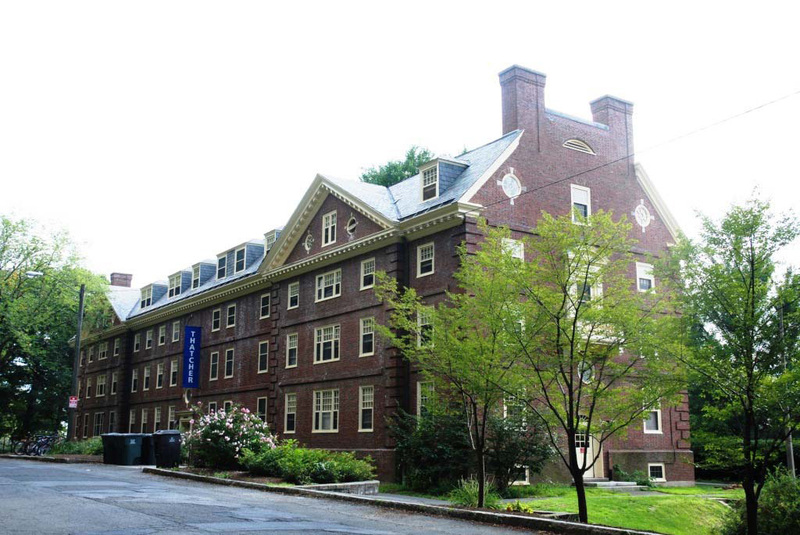 Historic plans indicate that Thatcher House (1935) was the first building of the residential quadrangle complex to be constructed. The site for Thatcher House is first shown on a 1933 proposed master plan for the campus grounds, although the building was not constructed until two years later. In 1919, prior to construction of Thatcher House, the site of the building was occupied by experimental orchards and experimental grass plots. Historic images show crops in the area to the west and southwest of Thatcher House following its construction. A 1935 campus map is the first plan to show Thatcher House following its construction. The plan shows walks bordering all four sides of the building with connections to the building’s entrances and Thatcher Way to the west (extant). A 1943 campus map shows the landscape around the building consisting of a street tree planning along the west side of Thatcher Way (no longer extant), trees at the building’s corners along the western façade (no longer extant), and walks on all four sides of the building (extant). Access from North Pleasant Street was provided by a walk that runs perpendicular from North Pleasant Street to the southwest corner of the building (extant). A ca.1948 campus map shows a similar treatment of the landscape. A comparison of the existing conditions with historic photographs of Thatcher House indicates that landscape immediately surrounding building has changed from the time of its construction. Changes include the introduction of ground cover and bark mulch to the formerly grassy slope along the western façade, new mature deciduous and evergreen trees on the western slope that block formerly prominent views of the building entrances, the loss of evergreen shrubs that once framed the principal building entrances on the western façade, the loss of clipped evergreen hedge that bordered the walk on the top of the western slope, the loss of climbing vines on the southwest corner of the façade, and the loss of deciduous trees at the corners of the western side of the building. Early photographs indicate that the walk from North Pleasant Street was once elevated from the surrounding fields on a berm. The area has since been leveled, the result of adjacent new construction. 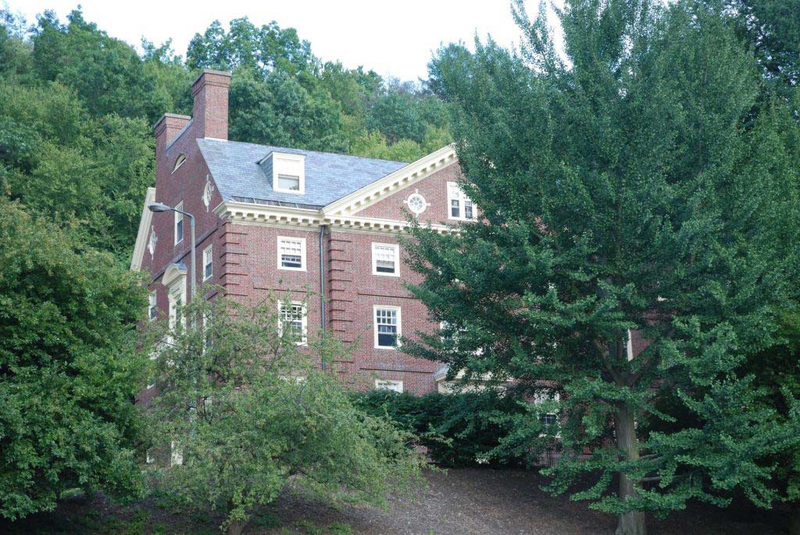 Thatcher House was named for Roscoe W. Thatcher (d.1933), who was President of the College from 1927 to 1932, during which time the school’s name was changed from Massachusetts Agricultural College to Massachusetts State College.